We are super stoked to introduce our friend and Flipper University student, Kelly, who we are interviewing today. crazy big money flips. We’ve had people think we are doing well flipping because all the deals are in Florida. We’ve also had people think our year-round warm weather has something to do with the great stuff we find to flip. But that could not be further from the truth as you will read today. Kelly shares how she has been flipping successfully in any kind of weather, hundreds of miles from Florida. In fact, last week Kelly sold 8 items, totaling $1,200 and it was 23 degrees outside! She has been rocking her side hustle and we are so happy to share her story with you. Hi Rob and Melissa. Thanks for the invite to share my story. It’s good to be here. About me – I live in a suburb in Buffalo, New York. We have four seasons here, but as for the winter, it has been one of the coldest on record. I am a single mom, who has an adult daughter attending college. She has plans to go to nursing school and I am very proud of her. Up until a few months ago, I worked full-time as a waitress at a local restaurant. I did this for 35 years! As you probably can guess, the restaurant industry doesn’t give the greatest benefits, so five years ago I realized I needed to get a job that would provide health insurance. This brought me to my current job working in a hospital full-time in the transport department. I transport patients back and forth to their tests walking all day long. I average 7 to 10 miles of walking a day. Great exercise, but very hard work! When I started my job five years ago at the hospital, I decided to keep working my waitressing job for the extra money. I would come home from walking all day at my transport job, change my clothes, and go directly to the restaurant three nights a week. I was working 16-hour days and it was exhausting to say the least. As a normal routine, I would be gone from home from 7 am till 10 pm. I did this for five years! I had always enjoyed dealing with the public and I especially enjoyed waitressing. As I continued to work these extended hours, it took a toll on my health and my overall wellbeing. Instead of loving my work as a waitress, I started dreading having to go into the restaurant. I found myself unhappy a lot of the time. But because I needed the extra income, I continued on like this for a few years. One day, I went to the restaurant and while working, I had a total melt down. Right there, I decided I was done working those crazy hours. I knew I couldn’t keep going like that any longer. I gave my notice to my restaurant employer and two weeks later I was done. But leaving the restaurant didn’t solve my #1 problem – money. My daughter was really struggling at the time and I really had in my heart to help her. I knew I needed to continue making the extra money to help support her as she went through college. I saw how much stress my daughter was having juggling bills, working full-time, and going to college. To continue to help my daughter, I decided instead of working like a crazy person at both my waitressing job and my transport job, I would just start working a ton of overtime at the hospital! I’m sure you can imagine how this worked out. I worked and worked and worked totally wearing myself out. I really had a battle going on. On one hand, I wanted so badly to help my daughter, but on the other hand, I knew I couldn’t keep abusing myself with work any longer. I had to find another source of income that didn’t require so much of my time and energy. This started my search for ways that I could make some good side hustle income so I could quit working overtime. 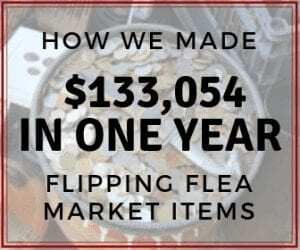 A simple google search landed me on Flea Market Flipper’s blog. There I found Flipper University and decided if I was going to do something, I had to jump in with both feet. I signed up for Flipper University right then and there and I haven’t had any regret about that decision one bit! How much money did you start with and how long did it take you to start making some great side hustle income? I think that’s one of the biggest misunderstandings about flipping and maybe why people are so reluctant to start. Contrary to what a lot of people think, you don’t need any money to start. I first looked around my house for things I had stopped using that were just taking up space. I started researching what items might sell. To my surprise, I found an old dusty Rainbow vacuum cleaner that had been sitting in my basement for eight years! I cleaned it up, listed it, and sold it for $450. With the help of the Flipper U and Rob and Melissa, I learned how to ship this large item and I was off and running! This sale pretty much started things off for me. I took the money I made from that, reinvested it, and I have been going strong ever since! I was pretty happy with how fast I started making money after I took Flipper University. I took the class in October 2018 and started making a profit immediately. By Christmas 2018, I was making a solid $1000 extra a month putting 10 hours of time into it. 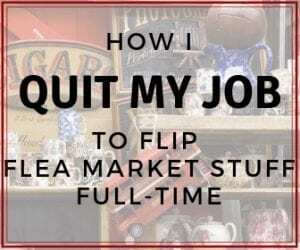 I have been able to completely stop working all overtime because I have replaced that income with my flipping hustle. I have learned a lot from you both and also from the students in the private Facebook coaching group. I haven’t met any of the people in the group personally as they live in all parts of the United States and Canada, but we are such a close-knit group. We help each other and any time I have a question it gets answered by everyone. 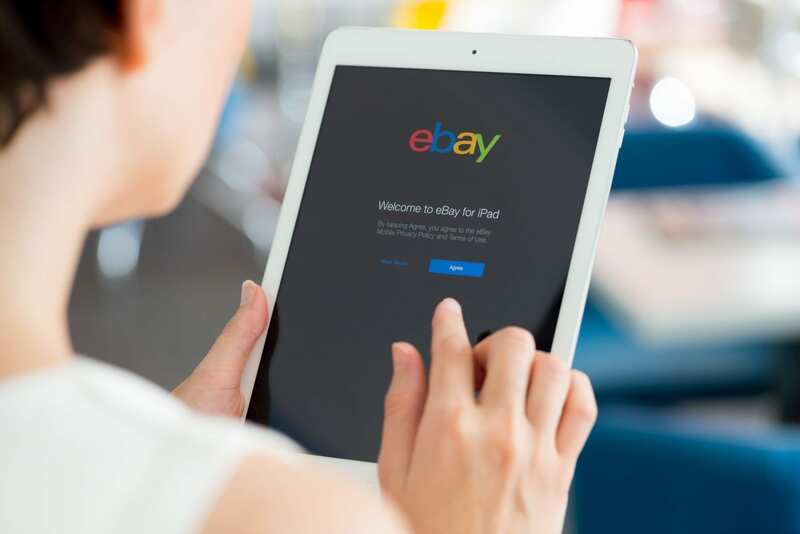 I have learned how to reply to unhappy customers, how to make my listings stand out, and I get daily ideas for selling items from the people in the coaching group. It may sound corny, but we are pretty much family! One of the best things I have learned from the coaching group is the importance of making contacts and connections in this business. Thanks to you and Melissa, I learned this early on and it has been a great benefit to me both financially and in managing my time. A few months ago, I purchased a Dyson blow dryer for $50 on one of the local selling apps. I listed it and sold it in 5 minutes for $170! Not too long after that, I got a message from the guy who sold it to me. Come to find out, he had pallets of the Dyson blow dryers! I made a connection with him and I now buy 20 of them at a time! It’s sort of a little niche that I have and it’s making me some great money! Those contacts are important because it eliminates the time I have to spend looking for items myself. I basically have someone looking for profitable items for me and it takes up none of my own time. He’s getting what he’s asking for the item and I am making a great profit. This contact has been such a great source of items for me and has been very significant for my business. 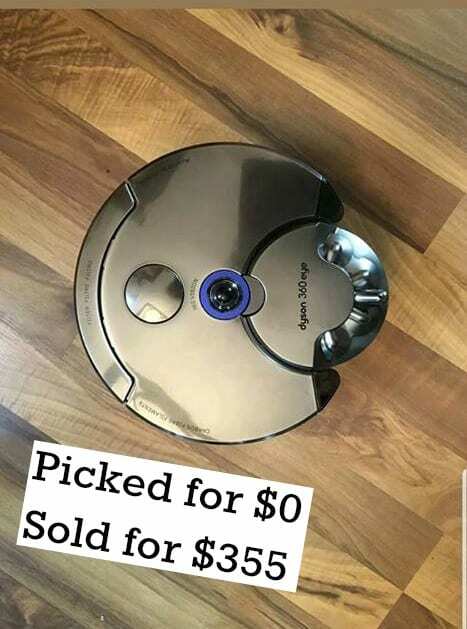 He recently gave me a Dyson IRobot that wasn’t working. Because we had made a connection, he didn’t want any money for the item. 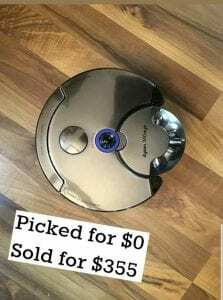 I listed it thinking who would ever buy a broken vacuum? I listed it and sold it for $355 plus shipping! You never know what people are willing to buy. It didn’t cost me a thing to get it and I made a nice profit from the flip. 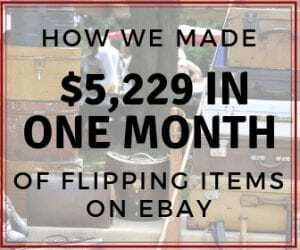 That’s the great thing about flipping – You can do it from anywhere all year round. In the cold months, I use the local selling apps, thrift stores, the indoor flea market, and my local contact to get a never-ending supply of great stuff to sell. I can do all of those things in my heated house! It has been one of the coldest winters here in New York. I haven’t let that stop me and no one else should let it stop them either! Last week it was 23 degrees here in New York and I made $1200 selling on eBay! I didn’t have to go out into the cold to be able to do that. In the summer months, on top of what I am already doing, I will be able to add yard sales and the outdoor flea markets. I can’t imagine what profit I will be making once the summer months hit. I’m pretty excited about that! The summer will just add on new sources for me to find great items to sell. If you live in a cold climate, don’t let that limit you. There are so many ways for you to make a profit all year round. What would you tell someone who is thinking about flipping but hasn’t taken the leap yet? 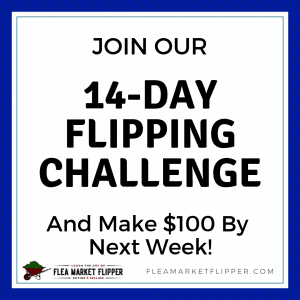 If you are thinking about getting into flipping, DO IT! When I started, I had fears. I was especially scared about the shipping. But honestly, once I took Flipper U and was able to get my questions answered, I was confident. After I sold and shipped a couple items and got the hang of it, it was so easy. I am pretty confident in shipping anything anywhere because I now have the resource of you and Melissa and the coaching group. My fears are pretty much gone and I am looking forward to how my flipping business grows! The truth is, anyone can do this in any part of the country. My long-term goals are to continue to get better at flipping, pay off all my debt, and get my daughter through nursing school. After that, I plan to start living life! Kelly, thanks so much for spending time with us to share your story. If you’ve been around Flea Market Flipper for any length of time, you know we get energized by watching our Flipper U students succeed! We know for Kelly this is just the beginning of an awesome future in flipping! 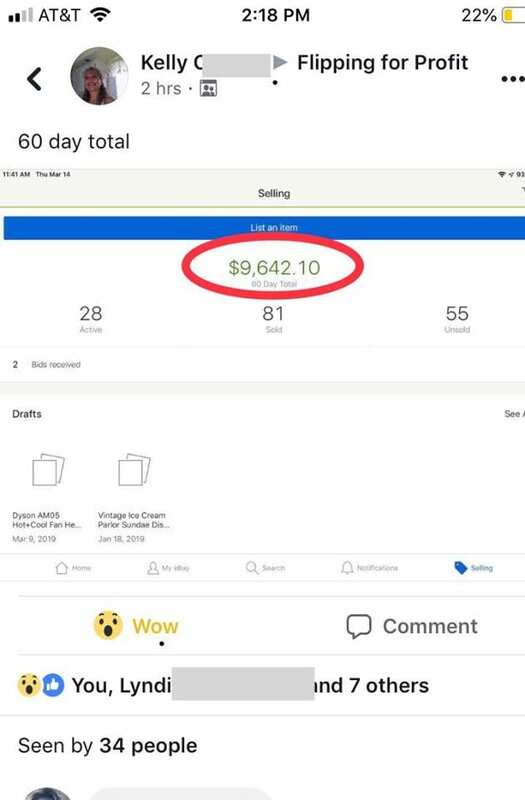 Check out her 60-Day total that she posted in our Facebook Group! 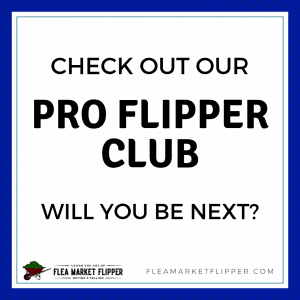 Huge congrats to Kelly for skyrocketing through the $5K and into the $10K Pro Flipper Club! Kelly is proof anyone anywhere can be successful at flipping either as a side hustle or a full-time job. Whatever your financial or personal goals are, flipping can play a big part in getting you there. Are you ready to jump in with both feet like Kelly and make a change in your life? Maybe you are working two jobs like Kelly was and can't stand the dread of working the next shift. Or maybe you are still searching for a supplemental income to fill the gaps in your finances. If any of these sound like you then check out Flipper University to see if flipping could be a great answer for you! 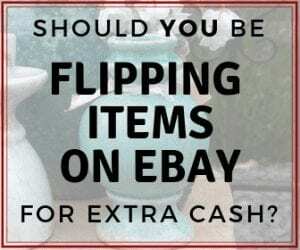 Have you thought about flipping items for a side income? What's holding you back from getting started?